Think cooking a whole chicken is hard or time-consuming? Think again! It's never been simpler with this Easy Instant Pot Whole Chicken recipe that is super quick, yet still results in a moist, crispy bird in just one hour. Bursting with fresh herbs, lemon and garlic, this meal is a perfectly healthy dinner for the whole family that's also keto, paleo and Whole30! Liberally salt and pepper the inside of the chicken. 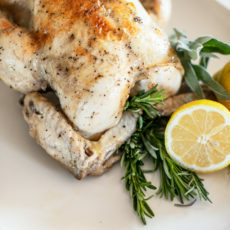 Stuff a 4-pound fresh, whole organic chicken with garlic, onion, lemon, thyme, rosemary, sage, and bay leaves. Gently loosen the skin from the chicken breast, lifting it from the meat with your fingers and rub about 3 tablespoons of butter under it. Rub 3 more tablespoons of butter all over the chicken surface and season with salt and pepper. Add a trivet with handles to the Instant Pot and add chicken broth. Place the chicken on top of the trivet and cover with the lid, lock it, point valve to sealed, press High Pressure and set the timer for 20 minutes. Let the pressure naturally release for 15 minutes, followed by a quick release of the remaining pressure. Remove the chicken and test temp to ensure it's cooked to 165F. Place chicken on a baking sheet, breast side up. Brush melted truffle ghee over top of chicken. Broil for 5-8 minutes, or until skin is golden-brown and crispy. Serve and enjoy! For every pound add 6 minutes, for every half a pound add 3 minutes to total cooking time for whole chickens.